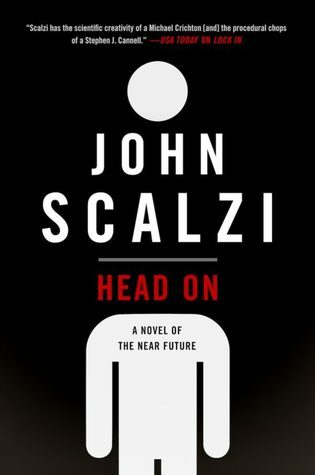 I want to thank the publisher and the author for a finished copy of Head On. I received it right around the same time the audiobook released so I ended up going the way of audio this round. Another Scalzi book, narrated by Wil Wheaton, that I crushed in less than two (2) days. That should give you some inclination as to how enjoyable and engrossing the two (2) novels in this series have been. In Head On, the sequel to Lock In, we venture into the future world of professional sports and the investigation surrounding the death of a star athlete. Hilketa is a brutal and fast-paced game played with hammers and swords. The goal being to lop off your opponent’s head by any means necessary and chuck it through the opposing team’s goalposts. The game is played using “threeps” – robotic bodies that are controlled by people who have contracted Haden’s Syndrome – so the violence and fierce competition is there without any worries of injury or death. When one of the sport’s stars drops dead during a pre-season game and is rushed out of the arena, our favorite FBI duo of Shane and Vann are on the scene to get to the bottom of what happened. But was this tragedy simply an accident? What they don’t expect is to find themselves in the middle of a power struggle for the future of the sport and their own lives in danger. Having finished Lock In just yesterday, it was a seamless transition into Head On. Having said that, if you haven’t read Lock In, you can still read Book 2 without having missed a whole lot and still get plenty of enjoyment. Just think of it as another mystery and not as a sequel. The only thing you will probably be confused about is Haden’s Syndrome and where it started (which there is a novella called Unlocked: An Oral History of Haden’s Syndrome that can be read for FREE over on Tor’s website to give you more of an understanding). This novella is also an add-on to Lock In’s audiobook. Scalzi does a fine job drawing me right back into his world and holding my interest with every page turn (100 words read?). Being an avid sports fan, the introduction of Hilketa was a definite positive in my book and grabbed my attention from the very beginning. Having said that, the book focuses more on the ins and outs of the sport as a business, rather than entertainment, and shows the darker side of players and managers off the field. But what I really have enjoyed over these two (2) books is the character development. While we technically don’t get a full glimpse into the lives of any of our characters, I simply enjoy being in their company. From Shane’s roommates to Donut the cat, I can’t get enough of the back and forth banter, witty jabs, and sarcasm. This mixed with Wil’s delivery is just a perfect combo. All in all, Head On is a fantastic follow-up novel and I recommend it to everyone who read Lock In. I also suggest anyone who enjoys science fiction/cop thrillers to give at least one of the books in the series a shot. I’m excited to start this! Glad you enjoyed it, I had a blast with Lock In so I’ve been anticipating this for quite a while. Ah, I hadn’t realized you had already started Head On and now you’re already finished! It was a fun book, wasn’t it! I liked it was much as the first book, and in some respects, this sequel was even better. I loved the whodunnit mystery and the action of Hilketa. For sure! I felt that the pace was quicker in this one and that’s what kept me so engaged. Also forgot to mention the personal spaces. Thought those were very cool, ala Ernest Cline in RPO. I’m really looking forward to this one! I am also going to do audiobook, and actually have both versions. Curious to see how they compare. Let me know what you think of Benson’s narration! Really enjoyed Lock In. Glad to hear this sequel is great too. Wil Wheaton and Scalzi are a winning combination! I enjoyed the first book so it’s great to see all these positive reviews. I will pick this one up soon (ish).